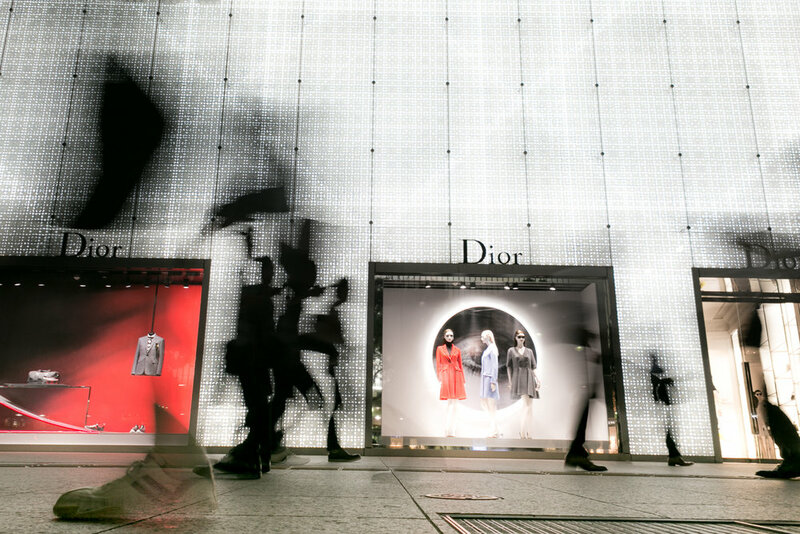 The Dior building in downtown Nagoya is a brightly lit, sparkly building next to a busy pedestrian sidewalk, and so it makes a nice background for silhouettes. In a recent post with my photographer friend, Jed, we tried some panning shots there and had fun, so I decided to go back and try some more. For the panning shots, I had the speed at about a half second and tried to pan along with the walkers to blur the background but keep the shape of the walkers, so naturally their bodies look solid, but their legs are blurry. For the last shot, though, I wanted to try for the opposite effect. I held the camera very low to the ground and tried to hold it still as walkers went by. This time, the speed was about a second, which is about the amount of time your foot stays in one place while walking. This created a situation where the walkers feet appeared as solid images, but their bodies, which were moving at a steady pace, mostly became invisible, except in areas where there were enough bodies clustered together to register dark shapes. I kind of liked the effect.